What vehicles will be on view during the May 9 parade? 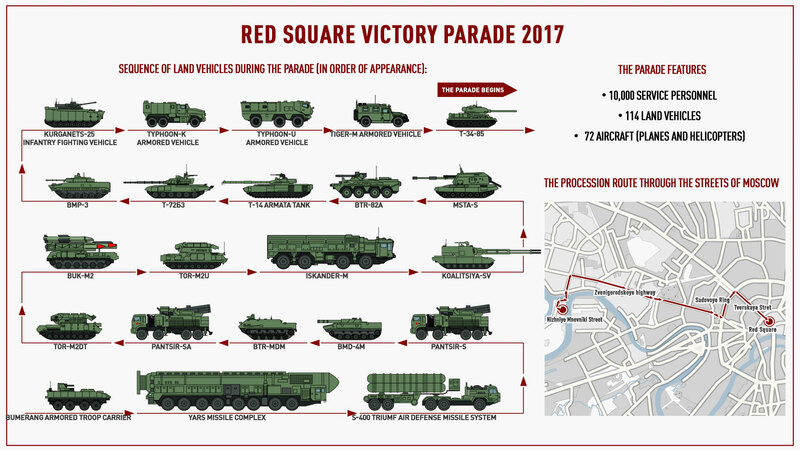 Red Square will witness 10,000 personnel marching in 27 parade formations. This year, more than 100 military vehicles will pass through central Moscow. Among them will be T-90 tanks and the latest T-14 Armata, plus Msta-S self-propelled howitzers, Tiger armored vehicles, Yars missile systems, and many others. This year’s debutants will be the Russian Defense Ministry’s Arctic Pantsir-SA anti-aircraft missile-and-gun complex and Tor-M2DT anti-aircraft missile system, as well as support vehicles specially designed for the Far North. Watch the May 9 parade live on RBTH’s Facebook page and YouTube channel. Find out more: What type of aircraft will fly over Red Square?